Hope and Holly are your normal girls been friends since high school til one day their life chances forever..
Hope is just your average girl who lives in a small farm house with her best friend Holly. Hope and Holly have been friends since grade school. 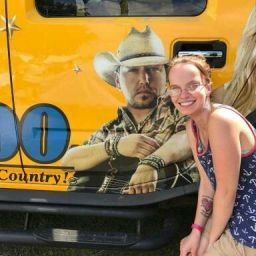 One summer day Hope and Holly are hanging out listen to B100 when they hear something and they both got excited. It was the high noon saloon and they were giving away tickets for that nights concert headlining was Jason Aldean and special appearance was Brantley Gilbert plus meet and greet. They continue to listen "Must be the tenth caller." they said. Hope looking at Holly said,"I want to win so bad." "To know when the right time comes you will hear &apos;Night Train&apos; as soon as that song plays be the tenth caller to win this one time chance to meet Jason Aldean." Holly knew how bad Hope has wanted to go to a concert of Jason Aldean and how better would it be considering the year they both had. The girls set and listened and as soon as they heard &apos;Night Train&apos; come on both girls were calling in. Holly was the ninth but Hope heard those two words that would change her life forever. "Congratulations you are the lucky tenth caller who do we have here." the D.J. asked "Hope Ashby" she replied so nervous that she felt as if she could faint. but she had the biggest smile on her face. The D.J. got her info and told her she need to stop by the studio and pick up the tickets as soon as Hope hung up the phone she and Holly started screaming and dancing around as if they were back in school. The girls went in and got dressed and headed to the studio to clam their tickets. As the girls arrived at the studio and looked thinking how amazing this is and how amazing this night would be and that they both have been fans of B100 for so long and never have they been at the studio before. Both girls headed in to the studio. The lady at the desk asked how she could help them. "I was the one who won the tickets." Hope said she pointed them in the right detection and they thank her for the help. When they reached the room they stood out side the door til the D.J. had a minute and when he finished he met them at the door. they receive the tickets after showing who they were and they headed home before the big night. They talked about what they wanted to ask and how excited this would be for them and to both get to meet him together was the best feelin in the world. The girls got home and started searching for the clothes they wear for that night. They found outfits that looked kinda alike but wasn&apos;t totally alike. Hope wore a pair of faited blue jeans tank top and purple and white shirt. She wore her cowboy boots and her earrings that matched and a horse shoe necklase. Holly wore the same but her shirt was blue. They grabbed the cowboy hats and headed out the door.